The latest events tied to two widely used remote access software programs left us with uncertainty (TeamViewer, VNC), however, since the ransomware attacks proposed safety doubts related to remote access software in general, here are a few frequently answered questions about the security users might be questioning right now. Is remote access software still safe? Yes, remote access software is still safe. ISL Online, the Enterprise Remote Desktop software, comes with strong built-in security mechanisms. Furthermore, several independent security audits and penetration tests have revealed that ISL Online is a generally trustworthy service and provides a strong level of security. Read more about the Security Tests. With over ten years of experience in the global market, we realise the distinction between good and great software and are doing our best to ensure the latter. Every release – minor, major or beta — goes through a series of thorough functionality and security tests and only when it passes every single one of them, it is labelled as ready for the user. In short, our security policy ensures that ISL Online remote desktop software uses industry-standard (SSL) security technologies to protect data transfer, while also RSA 1024-Bit Public / Private Key Exchange to negotiate symmetrical AES 256-Bit end-to-end encryption. Which security mechanisms does ISL Online use? Every security aspect is important, and therefore ISL Online protects your data through various data-level mechanisms, user rights and authorisation protocols, authentication, confidentiality and other. Read more about it in our Security Statement and blog post How secure is your remote desktop software? Gain insight into security criteria. Other than the built-in security mechanisms, SaaS remote access users can additionally strengthen security with various simple to use settings. Let’s see how. Open the ISL AlwaysOn app (ISL Online remote access) and click on “Settings”. 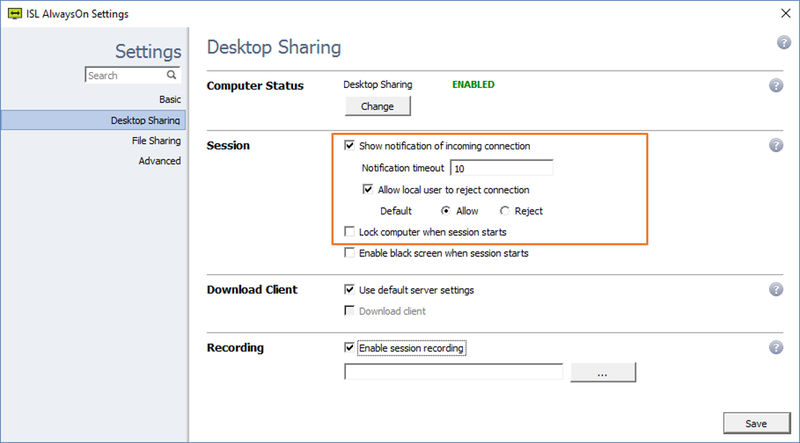 You can separately enable or disable services available for remote access, desktop sharing, and file sharing. You can define a global access password or generate printable one-time passwords for occasional remote access. You can configure ISL AlwaysOn to send you notifications by email every time someone has accessed or has failed to access your computer, a session has ended, or someone has downloaded a file shared from your computer. You can configure settings to show a notification when someone is trying to connect to your computer and enable the rights to either accept the incoming connection or reject it. 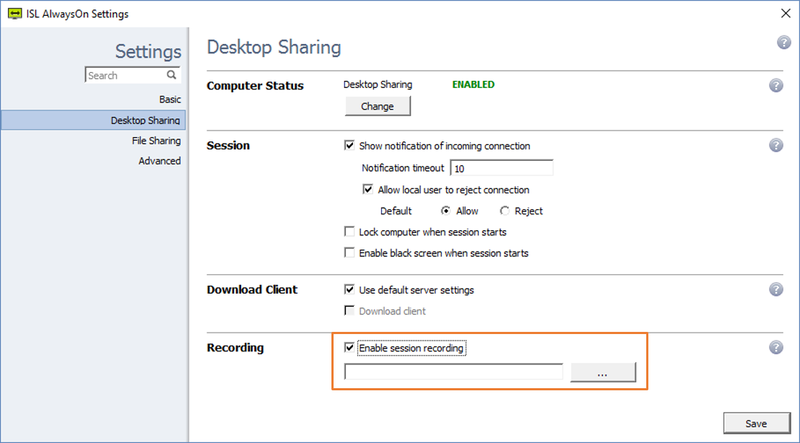 You can enable session recording for every remote access from the beginning to the end. Session recordings will be saved to a selected map. You can enable access filters for this connection by checking the Enable access filters checkbox. This will allow you to set certain limitations based on the IP and/or MAC address. Set up access filters if you intend to access the device from a specific location, e.g. from work or through a VPN. Those who prefer even stricter security requirements and have decided to go for the self-hosted solution rather than the SaaS, can keep all data in a closed corporate environment. Server License users are truly the masters of their own security and can choose from a list of over 70 security settings. Please refer to the Server License Security Manual for detailed information about different settings. What can users do to prevent attacks from happening? What’s equally important to preventing unwanted data breaches and theft besides the built-in security is the correct use of the software. Everyone with a piece of remote access software installed on their computer should acknowledge and respect the safety precautions suggested by the software provider. ISL Online, too, has prepared a list of security related suggestions and best practices, which help prevent ransomware and other attacks from happening. •	Use strong passwords for all operating system and computer access accounts. •	Remove all unneeded accounts from the operating system. •	Protect the ISL AlwaysOn configuration with a global password. 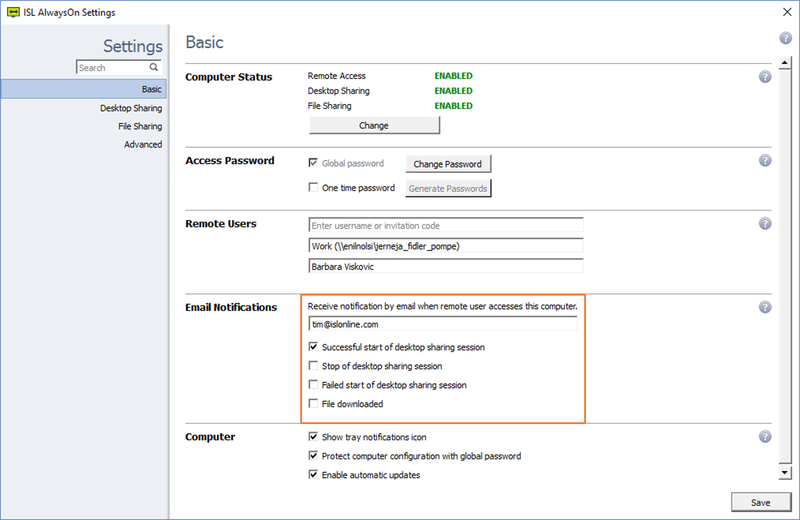 •	Enable email notifications for all remote access sessions and other events. 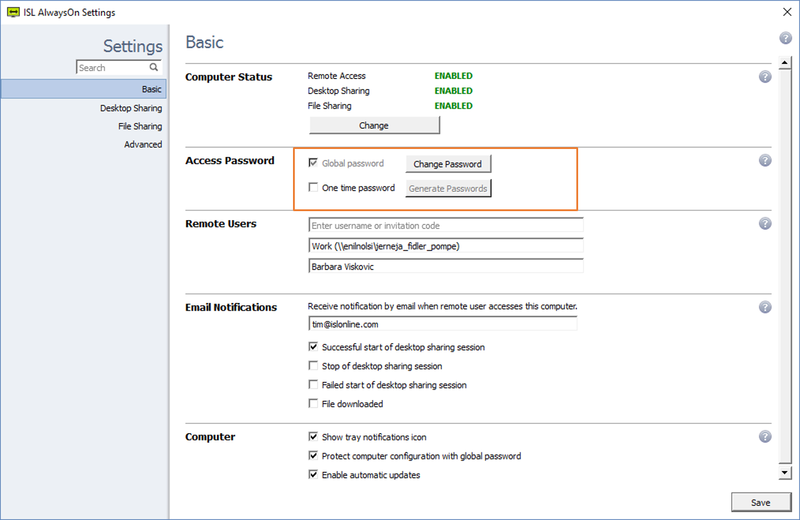 •	Enable the setting to lock the computer when accessed remotely. •	Disable the files functionality if you do not need it. All in one, you have every reason to feel perfectly safe using your favourite remote desktop software. We’ll keep doing our best in assuring maximum security possible, while you sit back and do your work at ease. Related article: ISL Online cloud remote desktop service is built on a strong technological commitment. 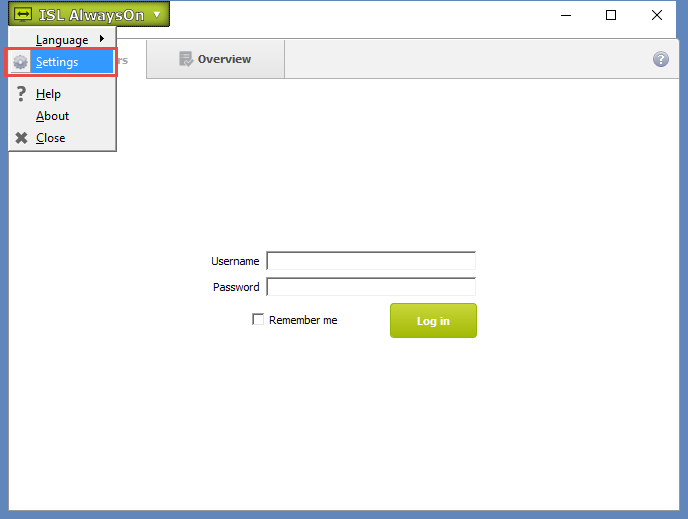 This entry was posted in security and tagged data security, ransomware, remote access security, remote support security, saas security, security, software security, teamviewer, vnc. Bookmark the permalink.